Practice Perfect™ Applied Ear Training Volume Three Today! 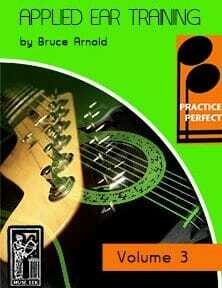 Practice Perfect™ Applied Ear Training Volume Three Improves Your Musicianship! Many of the Exercises in the Real Heavy Metal Ear Training tracks are in minor key centers. This will be of particular help to musicians that have problems with minor key centers. Some tracks also reference Locrian and other major modes. Most of these Real Heavy Metal Ear Training tracks are around 2-3 minutes in length. Each Real Heavy Metal Ear Training track has three different audio files. These tracks use either a soprano, alto or tenor voice which sings the answer. Most Real Heavy Metal Ear Training tracks having a moving melodic line in bass and guitar with occasional breaks using power chord progressions. Some Real Heavy Metal Ear Training tracks have moving fast moving power chords which are usually more difficult for beginners but are excellent for intermediate to advance ear training students. All Real Heavy Metal Ear Training tracks are stylistically related to the Heavy Metal idiom. This entry was posted in Bass Guitarists by Muse Eek. Bookmark the permalink.